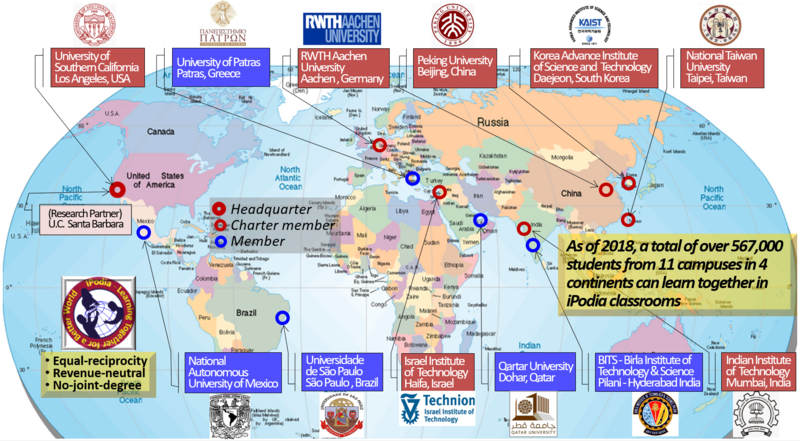 The iPodia Alliance (www.ipodiallaince.org) is an independent global consortium among leading universities to promote the iPodia pedagogy and establish a “classrooms-without-borders” paradigm for the 21st century higher education. The iPodia Alliance establishes a global learning hub around the world, creating joint classrooms and shared educational resources. iPodia students learn with, and from, each other across disciplinary, physical, institutional and cultural boundaries. iPodia learning outcomes include contextual understanding with global perspectives and mutual understanding of each other. As MOOCs (massively open online courses) moves classroom lectures from campuses to the Cloud, iPodia moves student interactions from the Cloud to classrooms on campus. The Viterbi iPodia Program Office at USC serves as the Alliance Administrator to provide required operational supports to all Alliance members free of charge. The Alliance is always looking at expanding its memberships to include more institutions from major world cultures. Since our goal is to promote intercultural interactions through peer learning globally, the Alliance develops its membership based on criteria that are different from those traditional university ranking schemes. Participating universities must have established undergraduate and/or graduate programs whose academic quality are compatible to that of existing Alliance members. This enables us to offer joint courses that can be formally accepted by member universities for academic credits. The “equal-reciprocity” principal encourages all participating members to strive for a balance between the iPodia courses offered to and received from the Alliance within a certain period. This ensures equal contributions and mutual benefits among all members. The “revenue-neutral” principal means that members are responsible for the costs of their own participation with no money (e.g., tuitions) exchange hands between any universities. This promotes the “not-for-profit” culture for the Alliance members to focus on win-win collaborations. The “no-joint-degree” principal declares that the Alliance’s main goal is to share courseware development and delivery, rather than create joint degrees among its member universities. This enables all Alliance members to maintain the independence and uniqueness of their curricula.